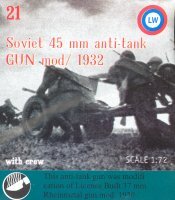 The 45mm anti-tank gun could be said to have started life as the 1932 model, and was a capable weapon that became the standard anti-tank gun of the soviet army. In 1937 an improved model appeared which looked little different to its predecessor, so both can be represented by this model. After the German invasion of the Soviet Union, it was found that the gun often failed to penetrate the thicker German tank armour, and the gun was given a longer barrel (amongst other things) to improve penetration, creating the 1942 model. This model follows the usual LW specifications, with a small number of pieces and some compromise in detail. However it is by no means bad, and for most purposes the level of detail will be quite sufficient. In general the gun is accurately sculpted, and fits together reasonably well to produce a sturdy little model. The rather measly three crew figures have not been given any bases, and none will stand by themselves. This allows them to get right up to the gun, and the arm positions of the two kneeling men give a good impression of their actually using the weapon, something many artillery sets fail to do. By propping the two figures behind the gun a convincing little tableaux is created. However the standing figure does not enjoy the same advantage, so seems to have lost his base for no good reason at all. All the crew wear standard soviet uniform, with the usual gymnastiorka present and correct, though since they are in action we would have expected them to be wearing helmets rather than the pilotka sidecaps. The sculpting is pretty good, with reasonable detail and little flash. At least one of the kneeling figures seems to be able to trace its ancestry to the Esci set of Russian Infantry, but has been very heavily modified. This is a nice little kit, supplemented by a handful of ammunition boxes, but we would have preferred to see bases on the figures so the customer could trim them if required. Still a fair effort, and though provision of the longer 1942 barrel would have been a thoughtful addition, this is still a useful if somewhat minimal product.